Irish baby shower card features shamrocks along with a blessing. Look down on you always from Heaven above. And may all of your blessings forever increase. 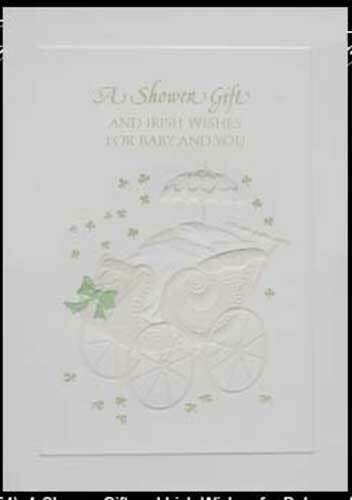 This Irish baby shower card features an embossed and gold foil design along with a blessing inside. The Irish baby card is made of heavy card stock and measure 5” wide x 7” tall; an envelope is included. This Irish note card is made in the United States.